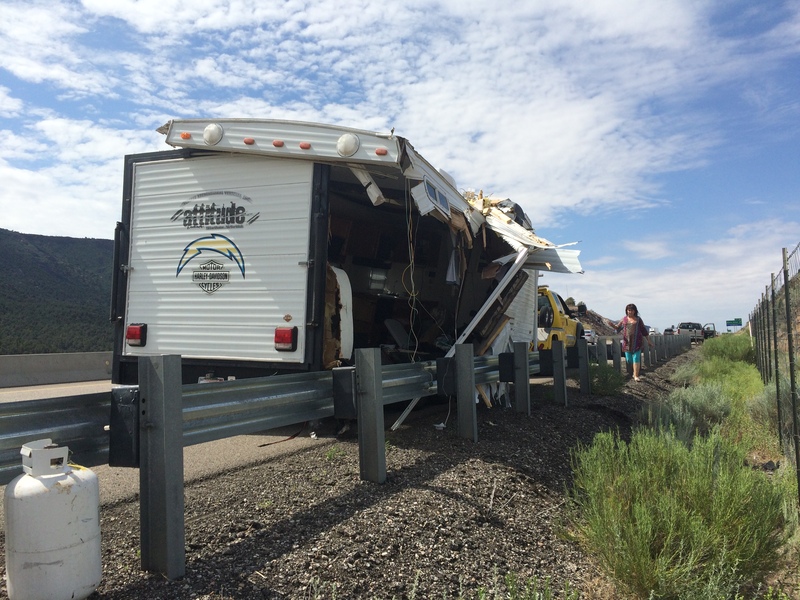 WASHINGTON COUNTY — Traffic on southbound Interstate 15 came to a standstill Monday morning after a truck pulling a trailer lost control, flipping the trailer and spilling its contents onto the roadway. 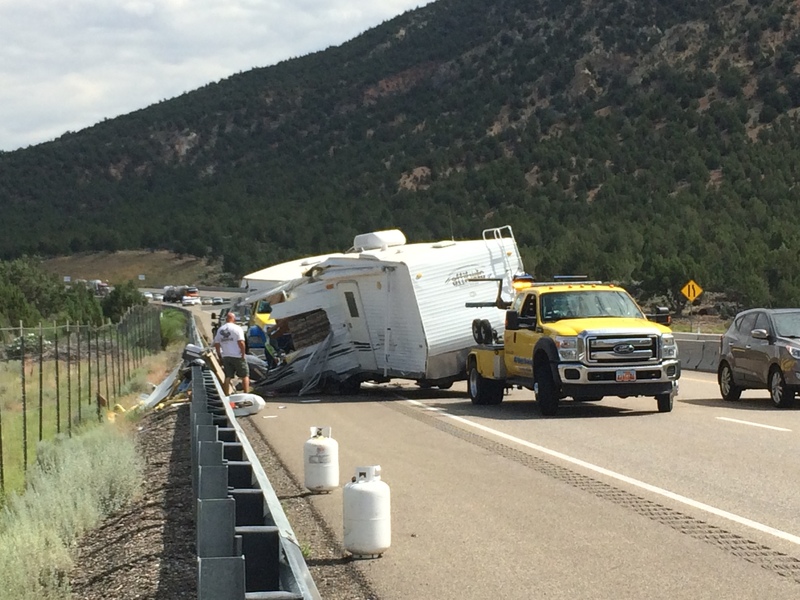 At approximately 9:35 a.m. near milepost 36, a California woman was driving a gold-colored Chevy pickup truck south on I-15 when the trailer began swerving back and forth, Utah Highway Patrol Trooper Chris Terry said. While the trailer remained attached to the truck when it flipped, the truck did not roll or flip along with the trailer. Luckily, Terry said, no other vehicles were involved in the accident. A male passenger and a young child were also in the truck with the driver, Terry said. The group was heading back home after enjoying a vacation. 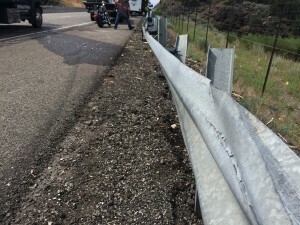 Members of the Utah Highway Patrol responded to the scene, Terry said, along with members of the Washington County Sheriff’s Office and the Utah Department of Transportation. No one in the truck was believed to have been harmed. 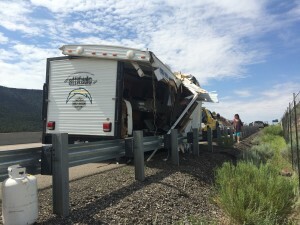 Traffic slowed to a halt while responders began cleaning up the wreckage and debris, which included two custom motorcycles, a mattress, clothing and other miscellaneous items from inside the trailer. After a short while, the left lane by the accident was opened, and traffic was allowed to trickle through as the cleanup continued. 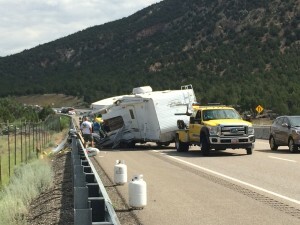 Multiple tow trucks were called to the scene to assist with removing the trailer and its contents. By 11:50 a.m., both lanes were reopened for use, and traffic was allowed to continue as usual. The woman driving the truck was not issued a citation, Terry said. While the truck was not believed to have been speeding at the time of the crash, Terry said he still cautions drivers to slow down in the area and keep their attention focused on the road. Terry also urged drivers who are stuck in traffic near an accident to be aware of what is going on around them and make room for emergency responders and tow trucks, who may be trying to get to the accident scene by driving on the shoulder of the road. Slip out of your cocoon some day and drive out of state, any direction, you’ll be amazed at how similar truckers and personal recreation vehicles are. Has nothing to do with your whine but if it makes you feel better,j whine. In Europe the trucks and trailers have to drive slowere. And one lane over.. I have been going there for 14 yrs, and never saw an accident on the Audubon. Trucks have there own lane and high speed cars stay in the left lane, no trucks, trailers over 55 mph.. People go too fast and over correct and then have load shifts and problems..